A quick post this, as it’s one of our busiest days at work, I have a tasting to attend this evening and yesterday afternoon, when I actually wrote this, I had a brewery open day to go and drink at. It’s a hard life. 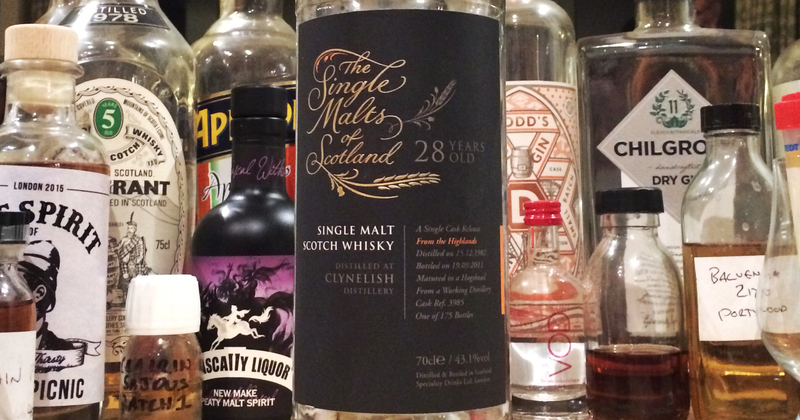 For day #14 I present one of my favourite whiskies of all time: Single Malts of Scotland Clynelish 1982, 28 Years Old. 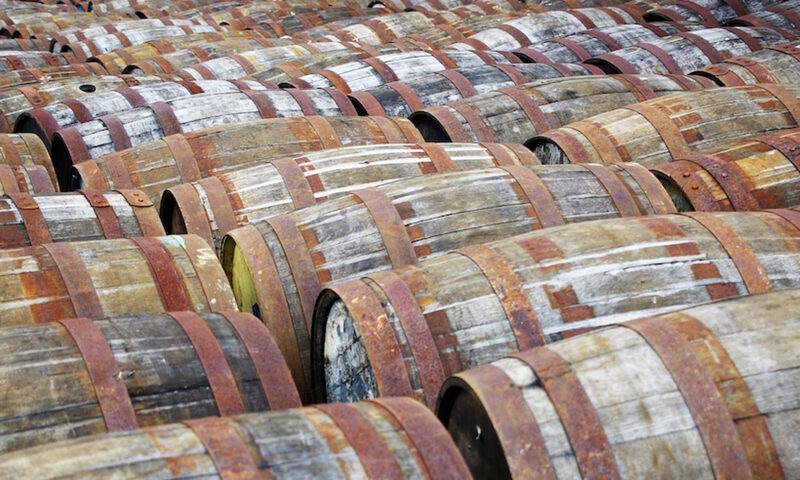 When I started working at The Whisky Exchange almost five years ago, I was not a purchaser of expensive whisky – I’d not spent more than £50 on a bottle, and didn’t quite get why someone would. Over the first few months of being immersed in the world of whisky full time, I started to understand, and by my first Whisky Exchange Whisky Show, I was ready to take the plunge and spend decent money on a bottle of whisky. If it was worth it. The first expensive whisky that I grabbed was a Single Malts of Scotland Clynelish 1972, bottled at 38 years old. the Single Malts of Scotland are bottled by a sister company of The Whisky Exchange, Speciality Drinks Ltd, and the 1972 was on the stand I helped on at the show. I was already a big Clynelish fan, and it pretty much blew my mind – so delicate and floral, with lots of depth and a huge finish. I snapped up a bottle as soon as I got back to the office, immediately opened it and found it to not quite be as good as I remembered. It’s still excellent, and I still have the remains of the bottle four years later. However, m’former colleague Tim didn’t agree with my purchase. He reckoned that the 1982 that we were also pouring was better, and after I opened my bottle of 1972 he sat me down with a glass of the 1982 and told me to compare them. As usual, the git was right, and I was forced to buy a bottle of the 1982 as well. Before it sold out, I managed to grab a few more bottles and they remain in my stash, awaiting a special occasion. Now, price. I don’t remember the exact numbers, but if my memory serves, the 1972 was about £150 and the 1982 about £80. That was only four years ago. Whisky’s getting expensive. Nose: A sweetshop – candy teeth, pink shrimps, hard candy letters and necklaces, white chocolate bobbly buttons, tom thumb drops and rose Turkish Delight. The traditional waxy distillery character is here in spades, with both musky beeswax and floral scented candles out in force, and there’s a touch of candied lemon sitting at the back. Palate: Soft with a big background of oak – I think I’ve left the bottle open too long. The sweetness from the nose is mixed with spicy oak and some dry wooden boards – the sweetshop is still here, but skewed to sour and fizzy sweets, with Refreshers (both chewy and chalky) and Sherbet Dip Dabs making an appearnce. Floral notes are heavy at first, but fade to a real, sour flower petals and damp oak. Finish: Floral and sweet with some oaky spice and a gentle sourness that fades away to apples and pears, before a waxy resurgence leads it to a final death. Highland Single Malt Scotch Whisky, 43.1%. I think the point about price is important, who wants to punt £80 on a bottle of whisky they may not like? I think maybe 15 years ago I bought a whisky sampler that had 8 small bottles (much larger than miniatures). This was perfect as it gave me a chance to try new drams that I might never had tried otherwise. Paul Jacques liked this on Facebook. ssshhh… you’re giving away our secrets as bloggers! Klaus Doblmann liked this on Facebook. It’s galling, isn’t it? Particularly as literally everything else has gotten cheaper in the last 4 years. Tim Hain liked this on Facebook. Charles McClean liked this on Facebook. Nick Bird liked this on Facebook. One of my great regret bottles. Sold so many of them but never put one aside! You ever find that occasion Billy…..well you know the drill. It takes the cork out or it gets the hose again! Claus Rasmussen liked this on Facebook. Aasish Basnet liked this on Facebook. Chocolatey and slightly sour, in an excellent way. Much better than last time I tried, but still a bit weird. Gummi bears, damp grain and appropriate levels of dankness. Crisp and dry with a touch of fruit and spicy malt running through the middle. Mid palate has a bit of a kick with some more weight and fruit. Rather nice. Thick and creamy with loads of balanced bitter and fruity hops. Apples and pears, with green leaves, custard and a touch of pine.